Polynesia’s friendliest archipelago is also its historical heartland. On 29 December 2011, Samoa changed time. Moving itself across the International Dateline from west to east, Samoa and its 186,000 inhabitants all at once became closer to Australia and New Zealand. Not physically of course. The archipelago stays where it is. What has happened is that Samoa has stepped back in time, literally. Visitors flying from eastern Australia will no longer arrive earlier the same day, instead arriving later the same day. Leaving Samoa will no longer involve losing an entire day. From December 31, 2011 visitors flying out of Samoa’s international airport at Faleolo (45 minutes drive from the capital city, Apia) will arrive in Melbourne or Sydney the same day. Losing an entire day upon returning from Samoa has become a thing of the past. Given that over 60% of visitors to Samoa are from Australia and New Zealand, the time shift has meant that travel to Samoa became vastly easier. 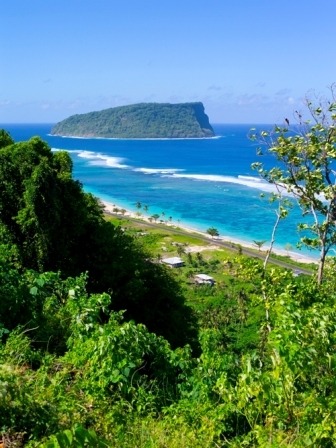 Samoa, known by many savvy travellers as the heart of Polynesia, is blessed. I could say Samoa is also blessed with some of the most attractive beaches in all of the South Pacific, friendly people too, comfortable tropical weather certainly. What I also mean is that it is blessed every day between 6pm and 7pm, the so-called ‘evening prayer curfew’ when all good Samoans indulge in some quiet down time, hopefully in contemplation or prayer according to Samoa’s government policy. In nearly every one of Samoa’s 362 villages there is a church. There may not be a shop or a post office, but there is a church. The only competition to churches as Samoa’s dominant shopfront presence, are remittance offices. Though tourism is Samoa’s largest industry, many Samoans rely heavily on remittance money from family members working abroad, mostly in either New Zealand or Australia. Remittance payments are Samoa’s second largest source of income. Don’t be surprised to see a Jehovah’s Witness hall next to a LMS (London Missionary Society) church next to a Western Union office in nearly all Samoan villages. One of many churches in Samoa. Samoa was colonised primarily by Congregational Christians, Catholics and Methodists. Like Tonga, Samoa is proud of its fiercely conservative Christian ethos. Seventh Day Adventists, Mormons and Jehovah’s Witnesses also have a significant presence in the god bothering community. Though the heads of these churches hold much moral power in their holy hands, some 18,000 matai (chiefs), retain social and political power. Through them Samoan culture and history is preserved. What the Lord taketh away, the Lord giveth back, right? While church going is part and parcel to Samoa’s way of life, I must add it’s all very relaxed. Balmy heat and cooling offshore breezes have taken some of the steam out of the proselytising. Thank goodness as it gives visitors plenty of opportunity to engage with some of the friendliest people in all of Polynesia. First time visitors to Samoa should prepare to do nothing. Quite simply there isn’t a lot to do. No adventure theme parks. No casinos (not yet anyway though rumours abound that a planning permit to build a casino at Aggie Grey’s Resort has been granted by the Samoan Government). There are no mega-resort hotels with kiddie activities and hundreds of rooms. No zoos or Sea World type aquatic attractions boasting frustrated orcas held captive in small tanks. No major sporting events, unless the Samoan rugby team wins big and hosts a Cup match. No large yachting marinas full of pleasure palaces. No thumping bars full of pie-eyed backpackers on a bar-hopping world tour. Don’t come to Samoa and expect a light show in a disco. Don’t even expect a disco for that matter. Apia is small and mostly quiet. Even more quiet as recent spates of violence between competing gangs of bored youths have been suppressed by police. One particularly notorious nightclub, almost next door to famed Aggie Grey’s hotel in sleep downtown Apia, has been condemned and closed. Apparently much of the violence originated there. The place now looks a wreck, seedy from the outside, dingy and reeking of stale beer and vomit inside. Once it may have been a fun place to down a few cans of Vailima (meaning ‘Five Waters’ and also the name of Robert Louis Stevenson’s estate) Samoa’s local brew, but those days are long gone. Demolition has been scheduled with shops and offices as replacements. Fugalei food market in Apia. Two markets are the lively places in which to hang out during a day or two in Apia, the Savalalo Flea Market, open seven days, and the Fugalei Fruit Produce market, also open seven days. Fruits and vegetables for sale. Siapo is the best buy. Tapa is the Tongan word. In Samoan, it’s siapo. They’re the same thing apart from different design themes representing tribal or family origins. A more complex Samoan siapo design. These hand-painted and hand-made textiles from the indigenous mulberry tree, or u’a in Samoan, are good buys at Savalolo. Fugalei is the place to mix with Apians shopping for the day’s groceries. While cruising through Apia’s ramshackle and mostly boring assortment of shops, I found a 2009 diary on sale at a second hand Christian bookshop, marked down to ten tala. What anyone would do with an outdated diary is beyond me but I considered the shopkeeper’s attempt as shelf filling quite endearing. Try as I might, I couldn’t find a 2008 diary for five tala to create a mismatched set. The most fun I had in Apia was during a ride on a ‘Pasi Liupapa’, Samoa’s answer to public transport. A motley collection of privately owned antiquated buses circulate both main islands as a service to the majority of Samoans. Though the bus chassis are imported, the rest of the vehicle is made proudly by Samoans. Picture an old Bedford truck chassis attached to a brightly painted wooden frame often festooned with cartoon figures. The handmade windows are cloudy and scratched Perspex slats pulled up from inside the framework that fit inside the window frame itself. To close, press against the Perspex, lift and let it drop back into the frame. When twenty slats are dropped simultaneously into their hard wooden frames, a sharp cracking noise ensues, which happens constantly during frequent but heavy downpours. Bon Jovi is played here. Each ‘Pasi Liupapa’ boasts an impressive sound system, the only contemporary accessory deemed compulsory. Drivers compete with one another in a contest to see who can play the strangest medley of tunes the loudest. When I visited Samoa shortly before the Christmas holiday, I heard various imaginative mixes of popular Christmas carols interspersed with Michael Jackson, Usher, Bing Crosby, Black Sabbath and Lady Gaga. Once I could have sworn I heard Rosemary Clooney. Timetables are virtually non-existent. At random I picked a Pasi outside the Savalalo market’s Pasi park simply because it was the first Pasi ready for departure. On the ride out to Apia’s hillside suburbs near the university, a quiet neighbourhood until my Pasi trundled down its sleepy streets blaring out ‘Thriller’ from loudspeakers that would make those in LA’s Coliseum sound meek, we stopped in front of someone’s house. One of the nicest aspects of riding a Pasi is that you can pull the cord connected to a buzzer near the driver’s seat and he’ll stop anywhere at anytime, from house to house if needs be. Riding a Pasi is not about arriving anywhere in a hurry; it’s about the ride itself. A large female passenger descended from the Pasi but got wedged in the door. Many Samoan ladies are of ample proportions, particularly around the hip area and this one managed to get herself stuck in the door like a cork in a bottle of Champagne. If she was going to come out, she’d no doubt do it with a bang. The driver, an agile young man, leapt out from his window, ran round to the door and grabbed hold of her arms. Her friends, who had already descended from the Pasi, grabbed her legs. Another female passenger shoved her backside from inside. Eventually she popped out of the Pasi and fell on to the grassy verge. What was so charming and funny about the whole scene was the shared laughter. The lady giggled uncontrollably during the whole potentially embarrassing experience. As did her friends and everyone else on the Pasi, including me. The two hour circumnavigation of Apia’s outer villages was an excursion of sheer joy and cost me about USD$5. Pool at Vailima used by Robert Louis Stevenson and his family. Apia’s other highlight is Robert Louis Stevenson’s home and gardens at Vailima, approximately five kilometres from central Apia. Stevenson’s final years are commemorated in the small museum. The house is a shrine to his memory and the impact he had on Samoans. ‘Tusitala’, the story-teller (as he was known locally) has grown large into one of Samoa’s national heroes, a remarkable honour granted to a Scotsman who came late in his life to Samoa. The hike up to his grave is well worth the effort. Bring mosquito repellent and wear sturdy shoes. Outside Apia and its modest night life, the remainder of Samoa is utterly quiet. Most visitors like it that way. The Samoans obviously prefer their peaceful yet fun loving way of life too. Come to Samoa and do nothing much at all, though choices abound: surfing, sea kayaking, beach combing, swimming, snorkelling or SCUBA diving. After a few days of beach-y somnolence, making a choice poses an outlandish challenge. It’s far easier to sit by a pool and read a book. 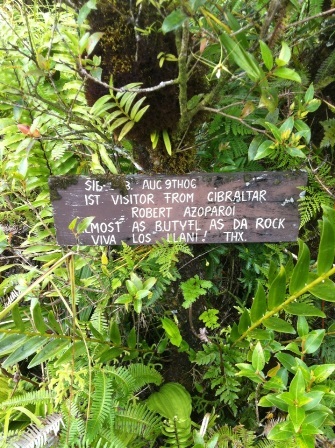 I trekked in a rainforest national park to Lake Lanutoo, the highest point on Upolu but found it strangely uninspiring. Indulging in doing lots of pleasurable nothing quickly became the goal I aspired to but sadly wasn’t able to attain. Perhaps I needed more time? Outside Apia, Upolu becomes even more tranquil. The island’s best beaches are on the southern side, almost entirely recovered since the disastrous tsunami of 29 September 2009. Nearly three years later, almost all the physical destruction has disappeared, though the emotional damage persists. I spoke with several people who had lost close friends and cherished family. The worst hit areas from Saleopaga to Mulivai have fully recovered and the numerous small resorts are open for business and eager to welcome visitors. I stayed at Litia Sini Beach Resort, a small family owned collection of fales right on one of the most beautiful beaches in all Samoa. This was one of the resorts completely wiped away during the tsunami and had to be completely rebuilt. Though Litia Sini is bare basic accommodation with shared facilities and simple food, the spirit of hospitality is genuine. I’ve yet to experience a better place to while away the days doing nothing but floating dreamily in the crystalline waters of the lagoon, rather like a baby in a warm womb, very reluctant to emerge into the real world. Enticed by my Tourism Samoa host to wake from my napping mind state, I felt roused enough to join a day’s ocean kayaking excursion to nearby Namua Island out past Upolu’s barrier reef. I’m thankful I did. With owner and chief paddler, Morten Hansen, a globe-trotting Danish yachtsman who ended up in Samoa while sailing around the world, we rowed into the wide open ocean swell. During the winter season (June to August) Southern humpback whales make occasional paddling companions, as do dolphins. We were happy with a dozen or so green turtles doing laps in the reef’s shipping passage. After a quick discussion we decided the fifteen kilometres paddling back to the beach off Litia Sini would be an exhilarating finish to the day, in stark contrast to my newly embraced Samoan influenced pastime of floating on my back in gently rocking tepid water while contemplating why lime and mangoes make such wonderful cocktail ingredients when blended with rum. Kayaking beyond the barrier reef to Namua Island off Upolu is a lot of fun. By the time I moved on to Coconuts Beach Club, where I stayed for two nights of rum infused beach combing inactivity, I became convinced that Samoa is time averse. There simply is no concept of time for most Samoans. Days are ruled by sunrise and sunset with a bit of church thrown in to sort out the truly guilty from the quasi guilty. Coconuts Beach Club Resort & Spa overwater bungalows. Next door to Coconuts is Samoa’s most luxurious small resort, the Sinalei Reef Resort and Spa. I can vouch for the food here as I ate the best meal I’d had anywhere in Samoa. Though Upolu is Samoa’s most populous island, Savaii is bigger, much of it still uninhabited. Dominated by Mount Silisili (1,858 metres), Savaii is the fourth largest island in Polynesia after New Zealand’s South and North Islands and Hawaii. I came to Savaii to look for palolo, the spawn of coral reef worms that rise on the high tides after the spring equinox during the full moons in either October or November. The ‘palolo rise’ (as it’s called in Samoa) in November is best off Upolu, in October off Savaii. I got the months mixed and was in the wrong place at the wrong time. It was late November and I was in a dinghy off Asau in northern Savaii right at the edge of an offshore reef about a kilometre from the beach. Palolo skimming takes place just before dawn, any later and the worms dissolve in the strong sunlight. Swishing my mosquito netted bamboo hoop into warm water, I managed to gather up a few remnants of palolo. Most Samoans eat palolo fresh from the sea. Tasting somewhat like cheap caviar with a consistency akin to mucus, palolo is an acquired taste. Though it can be frozen, it’s best consumed fresh. I was hoping to experiment with palolo and arranged the use of the resort’s kitchen to try out a couple of recipes. Most Samoans, when not eating palolo right from the net, fry it in margarine or butter and serve it on toasted white bread. I was keen to try it in a version of risotto nero or fresh pasta marinara with chilli and lemon. Unfortunately all I got was enough for a half teaspoonful, barely a taste. The tiny strands of greenish palolo shimmered bleakly in waning moonlight from the bottom of my hand-made net. I squashed a few worms between my fingers, licked them and tasted sticky salt water. The palolo I didn’t get. Palolo has traditionally been an important source of much needed protein, particularly for early Samoans. Nowadays, with Polynesia’s embrace of all junk foods a l’American (Spam, Hormel’s tinned corned beef or various tinned beef stews and tinned tunas), palolo is not as important. Instead palolo is harvested as much for social interaction as it once was for food. Many boats filled with chatty Samoans were casting nets for palolo off Savaii when I was there. We all should have been off Upolu instead had we been truly serious about gathering quantities of palolo but I suspect the pleasure of paddling into the night to watch the sunrise over Mount Silisili was the real drawcard. Netting palolo the traditional way. Daunted by Savaii’s lack of palolo, I went under water instead to look for other marine life. Only one dive operation exists on Savaii, aptly named Dive Savaii. Consistent with Samoa’s relaxed approach to all physical activity except football, diving from Fagamalo/Manase beach is a doddle. Wading into the water from a white sand beach, gear in hand, I boarded a small dive boat. We motored five minutes off shore, anchored, checked equipment and fell backwards into twenty metres of clear coral reef filled ocean. The main attraction there is the wreck of the Juno, a small schooner wrecked during a storm in 1881. The Juno was transporting missionaries from England to Samoa. No lives were lost, all passengers and crew swam safely to shore, no doubt taking their luck as a sign from heaven that the heathens were destined to be saved as well. During another day when I was forced from the addictive Samoan state of tropical torpor, I drove up to Mount Matavanu and hiked up to its crater. 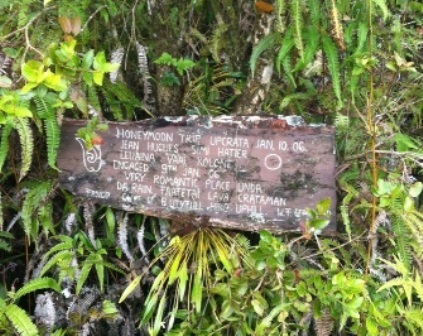 As in Vanuatu and most South Pacific nations, the land around the crater is privately owned and a custom price needs to be paid to gain entry. Cr8erman’s hand painted signs spread everywhere at the volcano. Here the land is managed, after a fashion by ‘Cr8erman’, an eccentric local character very fond of erecting hand painted signs around the crater’s rim, the track to its summit and the road between the entrance gate and the crater itself. ‘Cr8erman’ has a lot of time on his hands obviously or he’s unusually industrious for a laid-back Samoan man. I stopped counting his artworks after twenty colourful signs, deciding marvelling over the views of northern Savaii from Matavanu’s heights was a better use of my time. Cr8erman is very busy painting signs. One of the reasons Savaii is still relatively unpopulated is because Mount Matavanu erupted from 1905 until 1911, causing a large migration to Upolu’s less volcanically active landscape. Savaii’s other main tourist attraction, if it can be called that, is the Taga Blow Hole on the western side of the island. Facing the full force of the Pacific Ocean without the calming benefit of a barrier reef, this coastline is riddled with volcanic crevices, one of which has eroded into an underwater chamber with a hole in its ceiling. When the ocean swell is running high, Taga blows a fountain of seawater nearly a hundred metres into the air. I visited on a particularly calm day when the blowhole was about as strong as the current from my bathroom shower. Funnily enough, an elderly gentleman gains an income here by throwing green coconuts into the blowhole which are eventually swept into the current and expelled with great force high into the air. You pay him for the coconuts, stand back and wait to see a large nut shot into the sky. Pina coladas are not included in the ticket price. It’s an intriguing way to make a living. Blowhole at Taga on a rough sea day. Fa’a Samoa, the Samoan way of life, is unavoidably at the heart of any discussion about Samoa. Centred in culture, religion and family, Fa’a Samoa is the bond that holds Samoa together in a hectic world. Sunday is the day when families gather together for lunch, after everyone has attended morning church services of course. Like a Kiwi hungi; instead of burying the meat, fish and vegetables, a fire is lit, stones are placed on top and food is laid on the stones, covered and baked or steamed from early morning until midday. Then all the clans convene and feast until it’s time for an afternoon nap. After napping, most family groups make their way to the beach for a cooling dip or to watch the kids play in the shallows. Maybe a game of touch-rugby or a walk along the beach ensues. Evening prayer time follows, all beguilingly laid-back and pure in its old-fashioned innocence. Go to Samoa to discover Fa’a Samoa. It may not shake your groove thing, but it will shake your conscience. Tom Neal Tacker travelled to Samoa courtesy of Samoa’s Tourism Authority. Aggie Grey’s exterior in Apia. Are you a fan of Naked? Click here for information about our upcoming small group tours to the world's most exciting destinations specially chosen for NHT readers.